Plan ahead with what you're going to do with those fresh spring strawberries. 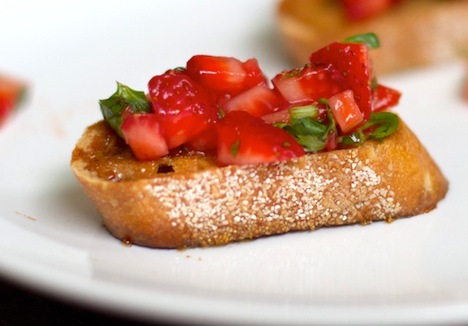 Dice your strawberries, tomatoes and Serrano pepper (remove seeds for a milder salsa) and place in a large bowl. Add in honey, basil, sugar, cilantro, lime juice and the balsamic and mix. Lightly salt if desired. Cut a baguette so that each slice is about 1/8 of an inch thick, and line them on a baking sheet. Warm up the honey in a sauce pan and using a brush lightly coat each of your slices. Bake at 325F for about 15 minutes, until the bread begins to crisp. Remove from oven, place salsa on crostini and serve.